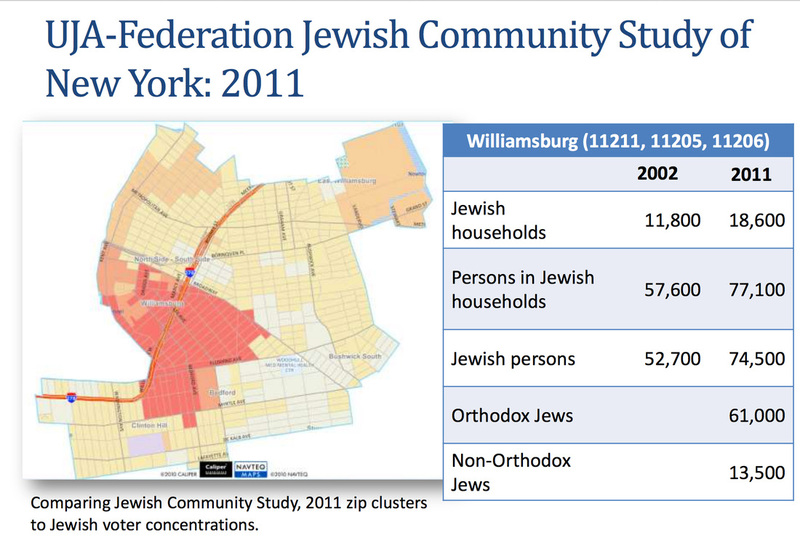 The Jewish Federation of North America released a poverty study in 2011 (and updated it in 2013) about the Jewish population in New York City. 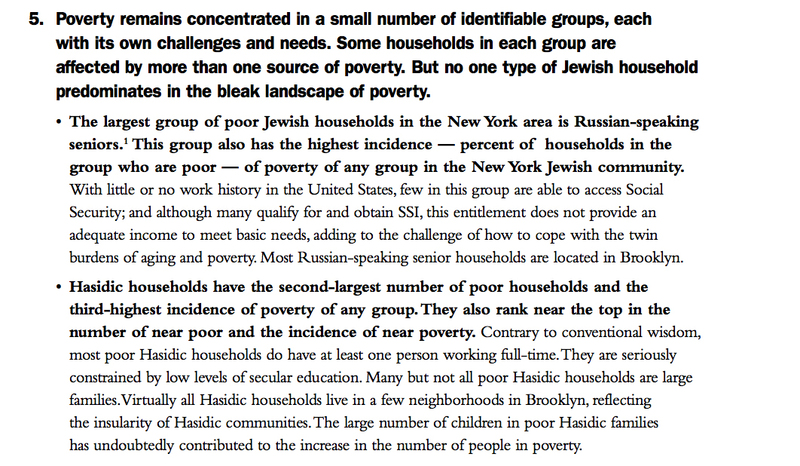 According to their finding “Hasidic households have the second-largest number of poor households and the third-highest incidence of poverty of any group.” Russian-speaking seniors came in first as the largest group of poor Jewish households in New York. In an attempt to assist the Williamsburg community in its financial need, the Berman Jewish Data Bank, a project of the Jewish Federation, put together some information about Hasidic Williamsburg for those who get involved in Williamsburg charity. Here’s their little tour into Williamsburg. This thin educational booklet begins with pictures of the more diversely orthodox Williamsburg of the past, looks at some data, and ends with emphasis on cultural sensitivity, or as they call it: cultural competence. There are concrete suggestions as to how to reach the community with aid and how to remain sensitive to Hasidic values. I.e, partner with gemachs (interest free loans) and established charities. This is very sensible, but I don’t know which, if any, charities the Jewish Federation or its affiliates are behind. What I found interesting are the population numbers. People are always interested in population numbers of the growing Hasidic community. I get asked for a figure all the time. According to this booklet, there were 52,700 Jews in 2002 and 74,500 Jews in 2011 (of which 61,000 were Orthodox, presumably mostly Hasidic.) It is really hard to parse the data because the 2002 information does not include the percentage of non-orthodox Jews. Also, there seem to be a significant number of non-Jews in Jewish households. Who would those be? Cleaning help? Or are these non-Jews living in the homes that are not Orthodox? I’m not sure. 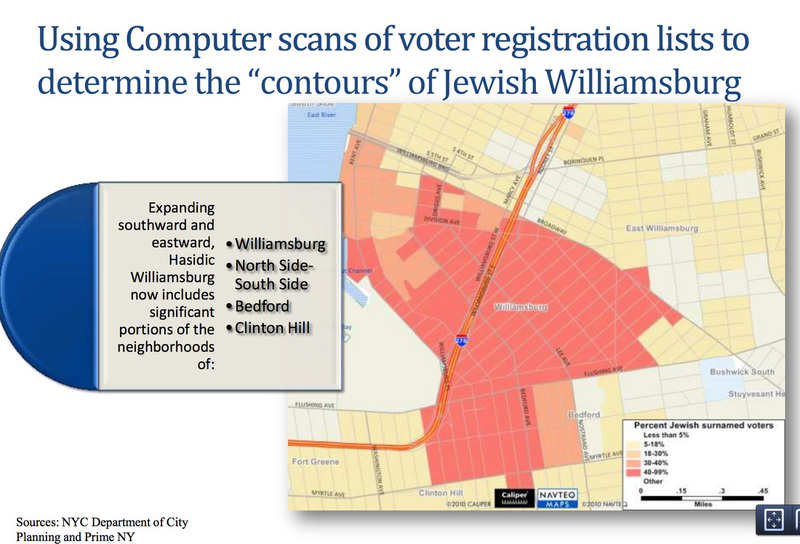 I wonder if this same source the Berman Jewish Data Bank used is where the New York Times took its figures when in 2004 an article estimated that there is a “community of 57,000 Satmar Hasidic Jews who live in south Williamsburg.” Clearly not all 57,000 persons living in Jewish households are Hasidic, nevermind Satmar. Are the NYT numbers a misreading of the data? Did the NYT assume that all Hasidic Jews are Satmar? I wonder. Equally interesting (or even more so!) in the booklet is the subdivision of schools. Here you can see that a whopping 38% of the Hasidic population do not attend Satmar schools but attend Hasidic schools of other sects, to which they probably belong. And here are the Williamsburg borders, color coded for where the Hasidim are settling. On a related note, you can find the population figures for the Satmar Hasidic village Kiryas Joel, where I’m from, on the census bureau’s website. Population 21,357. Because KJ is a separate Hasidic village, it is a lot easier to get a reliable estimate.